Bishnu had come to Baglung to receive me as I didn’t know where her village was. From when I met her to when I left her village the following morning, I would discover the remarkable manner in which this nineteen-year old had managed to keep her family together in spite of the direness of their situation. Bishnu and family. In the front row (from left) Rajesh, Rajkumar, Tulsi (stepmother), Laxman. In the back row (from left) Durga (her mom), Sharmila, Bishnu. Missing: sister Siba (who had gone to tend to her maternal grandfather in a different village) and sister Laxmi. The family had been very poor and heavily laden with debt to begin with. 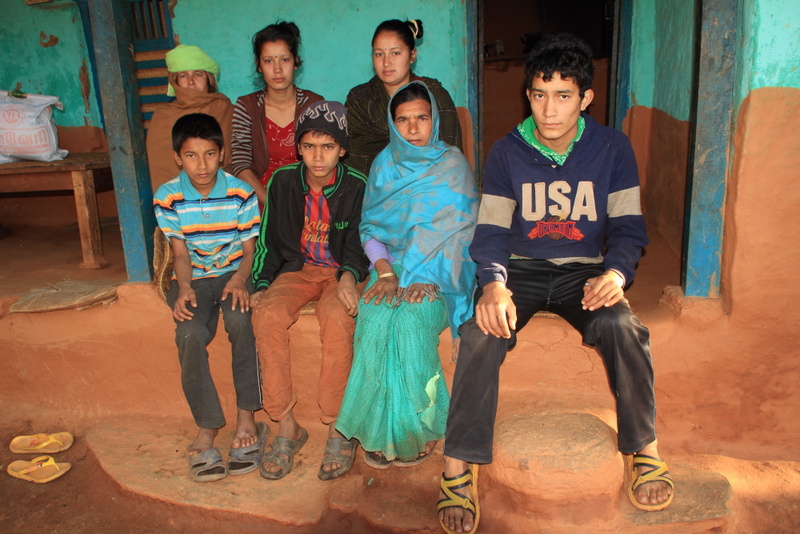 Bishnu’s dad, Dol Bahadur Khadka, even though already over fifty years old, in a last-ditch effort to dig his family out of poverty, had accepted a job working at a medical center in Qatar. But, just like scores of Nepalese, upon arrival in Qatar, he discovered they had lied about his work — he was put to work at a construction site. With no option but to do as told and in order to give his children and wives just a shot at a decent life, he probably went to work, in spite of his age, thinking he would punish his old body just long enough to pay off the debts. But it wasn’t to be. In July 2013, barely four months into his stay, he had died in an accident on the construction site, leaving behind Bishnu and the rest of her teenaged siblings, her mother and step-mother, saddled with the burden of not only providing for themselves but also paying off all the debts. When their father had been alive, they had been able to hold on to their assets. Since his death however, they have lost pretty much everything…their fields, their animals, their poultry etc. …paying off the debts. Luckily, the person who claimed their fields has agreed to let the family continue to till the land and share in the harvests. And the family who claimed their water buffalo, their source of milk and butter, has agreed to let the family keep it until such time when the children are old enough to pay off the debt. 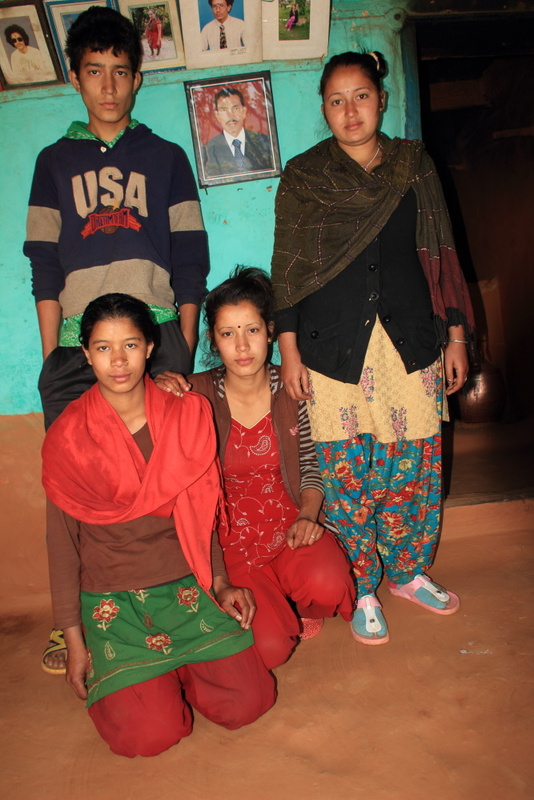 Bishnu & three of her four siblings from her mother’s side. Kneeling down (from left): Laxmi and Sharmila. Standing (from left) Laxman and Bishnu. The portrait is that of their father, one that Bishnu had him make, just before he left for Qatar, so that the family would have something to remember the way he looked when he left. Bishnu, who upon hearing of his dad’s fate, could all but barely keep her senses together, falling periodically unconscious and going into a dazed existence for a number of days, picked herself up for the sake of her family. She had to, especially since there had been very little signs of her mom recovering from the tragedy; the mother has trouble even managing to get through the days, still. Apart from the death of her father, Bishnu’s mother is suffering from the pain and sorrow of her own father’s grave illness. He is on his deathbed. The family sent Siba, Bishnu’s fifth sibling, to take care of him in Myagdi. Nineteen-year old Bishnu manages everything: the house, her siblings and their education, work in fields etc. She manages the monthly sponsorship fund of Rs. 15000 COMMITTED provides the family for their education. Her siblings help with chores around the house but she’s the one who makes all the trips to Baglung, the nearest town, as and when necessary (such as when they have to withdraw funds) because none of the others are able. She stills dreams of continuing her studies after 12th grade but she also knows that it’s totally unrealistic. Recognizing her responsibility towards her family, she sat for the Public Service Commission examinations to work as a forestry official in the district. She says she did pretty well, and that if accepted, she’ll have a permanent job making about Rs. 15000 (US$150) a month, just enough to possibly keep her siblings in school. She recognizes that that would mean the end of the road for her. 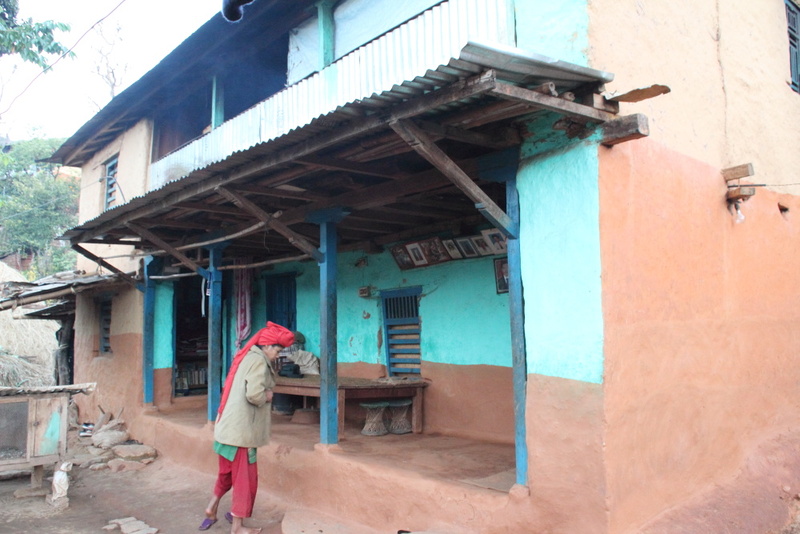 Bishnu and her family’s house, with Laxmi in front of it. Apart from worrying about her sibling’s education, apart from providing for the family of nine, apart from worrying how to bring her mother around, she has two other concerns. The first is that she might not be able to hold the religious ceremony her family must perform on the one-year death anniversary of her late father as per Hindu tradition. While she believes in the importance of the ceremony, she also recognises the cost — at about 80 thousand rupees — is prohibitively high. That’s about eight hundred dollars! The second concern the nineteen-year old is having to contend with is the possibility of losing their house, and, in turn, quite possibly what remains of her family. The house had been a collateral for some loans his father had taken a long time ago. Following his death, ownership was transferred to the creditor, an old man residing in Baglung. However, he has not claimed it as yet. Bishnu believes that is because he recognizes the situation the family is in. But should his sons get wind of it or inherit the property, they won’t be as kind. In that case, the family will be homeless, and most likely be broken up. Who knows then what future will hold for these beautiful and innocent children. Since the money owed is not anywhere near the value of the house, Bishnu has reasons to believe that the new owner will most likely hand over ownership if the family were able to come up with Rs. 90,000 (a little over US$900). The house itself is worth at least four times that. Monday morning, discussing some ideas for income generation and to give her mom something to do, Bishnu had mentioned how they used to have many more chickens than the two that were foraging around. At departure time, I left Bishnu with enough money for some chicks, promising to return to see them grown into hens and roosters! Bishnu promised a dinner of chicken in my next visit, unlike the preceding evening of rice and vegetables, cooked over a small wood-fired open hearth. Bishnu’s story is not an unusual or exceptional story, sadly. For a while now, three coffins on average have been arriving at Kathmandu airport…DAILY! I doubt if any of those coffins bear the body of the son or daughter of a wealthy nepalese family. I have in my possession details of about over three dozen Nepalese that have died this past year, and the details of the plight of some their families. And these are details I happened to have access to. How many poor families have lost everything and have had their lives completely and totally destroyed? How many children from poor and marginalized families have had their dreams dashed since Nepalese migrants started going abroad? We will probably never know. Lives and dreams of such families and children aren’t even part of any statistics! Within the country, part of the blame lies with the politicians and bureaucrats responsible for making and enforcing rules and regulations. Part of the blame lies with the unscrupulous recruitment agents who knowingly trick poor and uneducated Nepalese. Part of the blame lies with the foot soldiers — the brokers — fanned around in almost all the districts in the country, I am told, selling poor and desperate, rural Nepalese, hopes and dreams, hopes and dreams that, in cases such as that of Bishnu and her family, turn out to be nightmares.